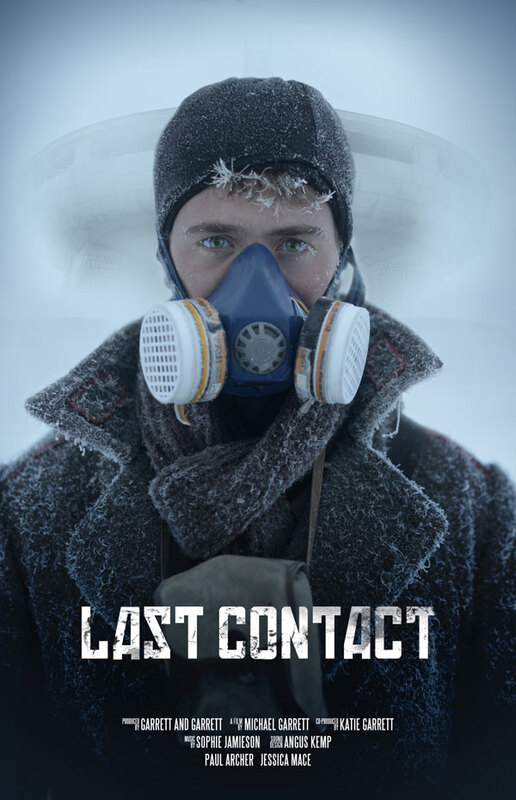 Last Contact is a short film portraying the despair of a researcher long after his last contact with the outside world. While the film is in the final stages of production, Michael Garrett, the man behind the camera, has turned to Kickstarter for much needed funds to finish and promote the film. We here at AISFP love what we see of this film, and our John Dodds spent a few minutes with Michael learning about the world of Last Contact. John Dodds: Michael Garrett, you’re making a short science fiction film called Last Contact and running a Kickstarter campaign to raise funding for some aspects of it. It came to my attention because I happen to live in Bulgara and I know the location of the shoot. So, can we begin by you telling our readers about yourself, then we’ll talk about the film. Michael Garrett: I came into film making a little bit by accident. I studied Biology and, after my degree, I somehow ended up persuading my University to fund a trip to Central America to make a short documentary about environmental conservation “voluntourism”. It was crazily ambitious and a massive learning curve, but we managed to make it work and turned a few heads with the final product. The film side of things just took over after that and now, two years later, I run a small video production company with my sister, making promotional shorts for small businesses. What I love about filmmaking is that it demands work from so many different disciplines: music, photography, story-telling, graphic design. It’s also such an amazing way of learning so intricately about things I would otherwise have never thought about; I’ve worked with gelaterias, glass-blowers, dancers, unicyclists; it’s introduced me to a lot of amazing people and it’s a different experience every time I make a film. John: First, Michael, tell us about your short film, Last Contact. What’s it about? Michael: Last Contact follows a lone character in a world where the atmosphere is toxic; the climate is unbearably cold and bleak. He’s been posted in a research facility out in the middle of nowhere, where he spends his days monitoring changes in the environment and maintaining his crumbling home, but we join this character exactly one year after his last contact with any other human beings. The film hints at the events that led him to this situation, but it’s ambiguous and after a year on his own, he’s beginning to lose touch with reality. John: How did the project come about? Tell us how the idea emerged and what was involved in getting it to completed script stage. Michael: Strangely, the idea was inspired by the location of the film. The research facility in Last Contact is a stunningly haunting shell of an old communist meeting place in the mountains of Bulgaria. It’s awe-inspiring to see, even in photographs, so I had to make a film with it at the centre. I’ve been an avid fan of science fiction since I stayed up past my bedtime at eight years old, watching Ridley Scott’s Alien. It seemed fitting that my first foray into fictional film should be a sci-fi and the script and concept evolved, aided by some writer friends of mine, with the aim of bringing some enigmatic character to the building itself. LAST CONTACT Trailer from Garrett and Garrett Videography on Vimeo. John: The whole thing is pretty much a for-the-love project, but it did cost you money. How difficult was it to fund, and to get the team together to make the film? Michael: Fund-raising is my least favourite thing in the world. I hate it. And I’ve never really known how to approach people for funds, or how to sell myself, so I decided that this would just be a fun project for the sake of a fun project and I tried to keep the costs as low as possible. Fortunately Bulgaria is not an expensive place to be, and the people there are really excited about film and foreign interest in the place. I’m fortunate enough to have a really talented, passionate, and patient group of friends who contributed to this film, but all voluntarily – no one was paid a penny for their work, and they worked real hard. Paul Archer is a very old friend of mine and I wrote the piece with him in mind. Partially because I knew he’d be the only person crazy enough to join me in -25°C up a mountain in a crumbling artefact of communist Bulgaria, but also because I knew he’d love it. And commit everything to the role. To spout the usual cliché, it was a labour of love, and I’ll probably never recuperate the money I invested, but it was such a fun, ambitious project that I would (and probably will) do it all again in a heartbeat! John: I live in Bulgaria and I’ve been to the former Communist conference centre, Buzludzha, where your film is set. How did you find this amazing location? Michael: About a year and a half ago, there was a link trending on facebook: “The 7 wonders of the derelict world” or something of that ilk. Of course Buzludzha captivated me immediately and through a lot of underground links, I managed to get in contact with people who had photographed and blogged about the place. They helped me out immensely; I can’t thank them enough. John: This is a science fiction film, obviously. What books, or films, or individuals like writers, directors and so on, have influenced you? Michael: I suppose I took direct inspiration from the Wool Trilogy by Hugh Howey. They’re really fun books, which follow various characters who are part of an underground civilisation, taught to fear the world above. I loved the intricacies of the world Howey created, and I also wanted to throw a hint of conspiracy into my film, which is a definite nod towards the Wool Trilogy. With regards to film, I’ve always been drawn to movies that detail the psychological struggles of solitary human beings. I’ve no idea why. Castaway is my favourite film of all time and, of course, I just went crazy for Duncan Jones’ Moon; that was a big-time influence for the film. John: You’ve launched a Kickstarter project to fund some post-production work. How will the funding be used, and what can funders expect in return, besides giving their patronage to this amazing film? Michael: The film is tantalisingly near completion, but promotion is the next hurdle. We really want the film to be seen by as many people as possible and, hopefully, turn some heads at festivals. Most of the money will be going to festival fees and promotion– independent screenings, social media advertising, distribution etc. It’s a humble target for such an ambitious film, but to do the whole thing justice, we need to give it the extra push it deserves. Rewards for pledging to the Kickstarter include tickets to screening events, posters, DVDs, we’re even giving away the exclusive link to the making-of documentary which will never go public! And it’s full of some ridiculous run-ins with police, car-spins, and all kinds of hilarious moments. Definitely worth a pledge! To learn more about Last Contact and to watch footage from the film, please visit the Kickstarter page. And, if you can, contribute to this talented filmmaker!